The 115 grain 9x19 projectile that features a fully enclosed base offers another option for those who must shoot a lead free projectile either by regulation or by range choice. 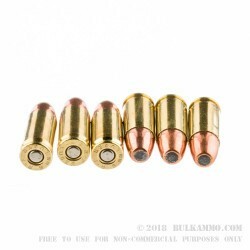 The actual benefits are surprisingly advantageous to high volume shooters that need a quality, high accuracy round they can shoot a lot of. The lack of a lead base to come in contact with the hot powder of the ignition sequence, means this is a good round to limit exposure on the shooting line to airborne lead particulate matter. Other than that, this round represents a value based shooting cartridge that is already well suited to most general use cases and is well within accuracy requirements for range shooters. 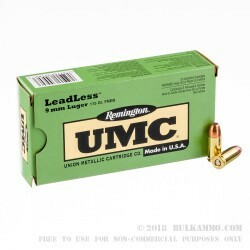 This is a very straightforward cartridge for any general use, in a 500 round case lot. Lead free projectiles minimize the deflection and ricochet potential and give a better shooting environment for the shooter. 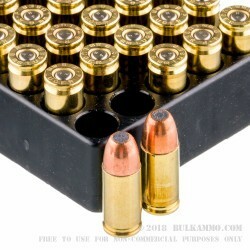 The price point of the lead-free type cartridges normally represents a premium over other range rounds; in this case, the cost is very competitive. Remington UMC is clearly committed to the improvement of shooter conditions and in coming into range safety best practices as they become more widespread for the general shooting population. 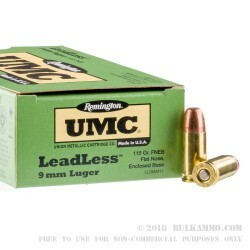 When you order this 9mm Luger ammo, you’ll get a 500 round package with 10 boxes inside. Each box contains 50 rounds ready to shoot.